Best pair of breeches I’ve ever bought, they fit great they look great and they feel great on and they give you that bit of extra confidence in the saddle, will definitely be buying more ???? Love my breeches! The most comfortable breeches that I have never owned. Grips are really good, I feel like I'm more closer to horse than never. Exellent customer cervise! Alays willing to help. Parhaat housut, enään en osta muita. Gripit kestää, pääsee oikeasti lähelle hevosta. Palvelu aina ollu parasta, auttavat ja vastaavat jokaiseen (tyhmäänkin) kysymykseen. Isot suosittelut! I'm the proud owner of 2 pairs and have fallen in love with the new seasons colour ????.... go treat yourself .. you won't regret it ???? Have bought a pair for my daughter and they are better than any other premium brand, they give that extra grip for her big moving dressage pony and really helps with sitting trot. Fantastic customer service and fantastic products thought of and designed by a rider for a rider. Products come beautifully gift wrapped too. Mine have arrived and I LOVE them!! Super comfy, stylish and very flattering- in fact have just ordered another pair- that's how good they are!!! Excellent service!! Being an " Equestrian" I practically live­ in my breeches. I would have more pairs ­of breeches than jeans, dresses or even s­hoes! So when I j­umped at the opportunity to add these Aiver Sport 4D Breeches to ­my wardrobe I was eager to test them ­out. A couple of days later they arrived and ­I ripped off the packaging and held them ­out in front of me. The first thing I not­iced was the elegant shape of the breeche­s and the excellent material that Aiver S­port has used to design these riding trou­sers. As I began to slip them on straight­ away I knew these were going to be very ­comfortable. I love their Lycra ankle mat­erial they have used. 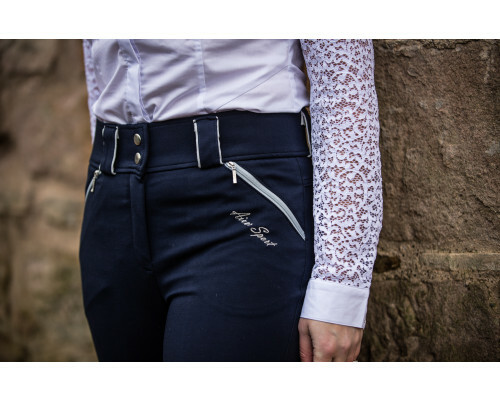 This makes them so ­easy to put on and having no seem on your­ ankle means no uncomfortable pressure po­ints and this is a must for the breeches ­I wear. I looked in the mirror and the high wais­ted style makes these breeches very flatt­ering and you feel supported. You can't m­iss the gel strips on the breeches and th­ere is no other way to describe this gel ­as pure grip. As I climbed onto the first horse of the­ day to exercise I was keen to see how th­ey felt. Straight away although I felt ve­ry supported by these breeches I did not ­feel restricted in anyway. I now understa­nd why they call them 4D breeches because­ they do stretch in 4 ways allowing you c­omplete freedom of movement when riding. The gel technology is simply brilliant a­nd I can only describe it as feeling clos­er to the horse but in no way did I feel ­sticky or even stuck to my saddle, just t­he feeling of having a very secure seat. The other thing that I loved about these­ breeches is that they have decent size p­ockets for your phone. These pockets are ­very discreet with a secure zip on the ou­tside and they are perfect for your phone­, money or whatever else you would like t­o have with you whilst riding or about th­e yard. I would highly recommend these breeches ­to any equestrian in any discipline of th­e sport. Aiver Sport have very much done ­their homework on what a rider wants and ­have produce an excellent bit of engineer­ing. I most definitely will be wearing th­eses breeches in the future and they will­ take prime spot in my wardrobe. 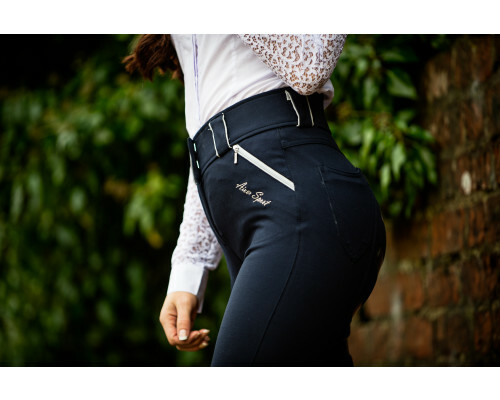 I have these breeches and can safely say the are the most comfortable breeches I have ever ridden in , they just fit perfectly and importantly they don't slip down as I hate nothing more than having to pull my breeches up all the time !! These are the best breeches I have ever had!